business from $5,000 to $80 million and beyond. The Fallenstein family turns their obsession with Halloween from a hobby into a business. The scene opens with mom, a seamstress named Jenice, sewing costumes and her three daughters, Julie, Lisa and Heather, renting them out from the family garage. Then the youngest sibling, Tom, starts getting involved with the business called Costumes Galore. It is a huge seasonal success in the region. Tom coming of age just as a somewhat futuristic tool known as the world wide web starts to emerge. Tom, intrigued by what it could do, began learning about its capabilities, teaching himself how to build websites. 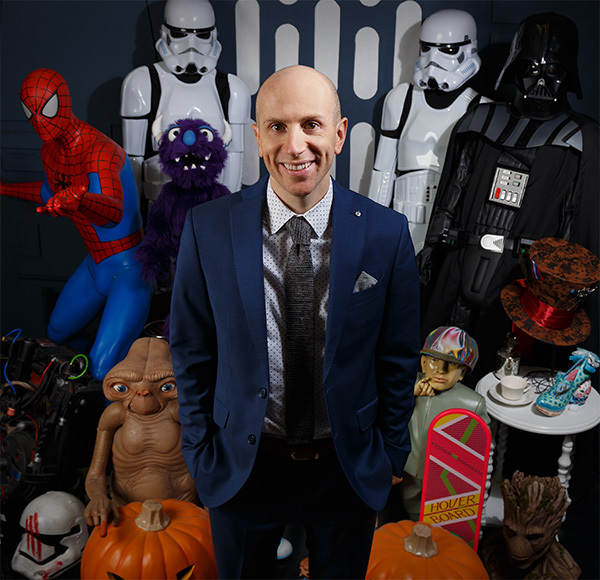 Tom followed his hunch to move the business online, selling costumes through a website. With just $5,000 to invest in a small inventory of costumes at first, within a couple of years he did $40,000 in sales. By 2005 he expands the inventory to fill the entire garage. That year, the business earns $250,000 only because Tom had to stop taking orders, as all family members scramble to fill the orders coming from the websites. The third year, 2006, shows the family, and by this time a few employees, moving from the garage to a 10,000sf facility in downtown Mankato. And the costume business hits the million dollar mark. Small town makes it to big time. And in a hurry. The script follows the journey of this family and the costumes over the next decade. A journey that shows the company growing in every way; inventory, people, domain names…at one time Tom owned hundreds of domains. Then the movie climaxes, when Tom decides to buy one domain that would encompass all the costumes his company had to offer. Halloweencostumes.com, which he purchased for one million dollars. But would his hunch work this time? This is not a movie script but a true story. 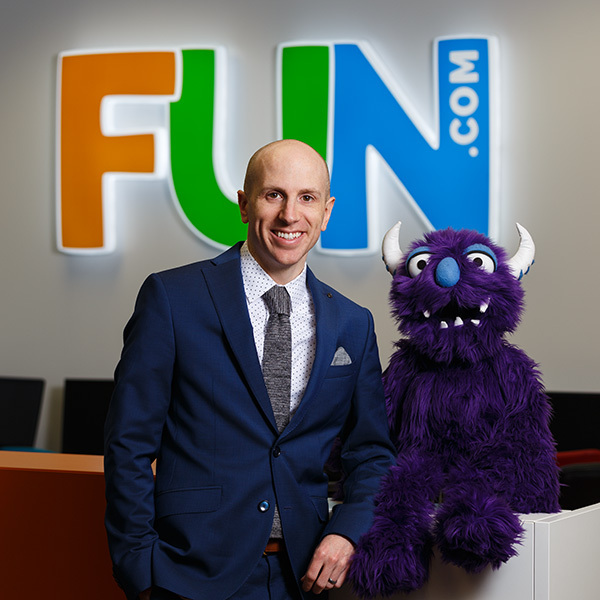 In real life Tom Fallenstein is now CEO of what has evolved into Fun.com. And the real story at this point isn’t where the company’s been, but where it’s headed. The Fallensteins have taken it from that small, family-run business operating out of a garage a couple months out of the year, into a business that now employs 160 year round as well as 1,700 seasonal staff. It occupies a 200,000 square feet facility in North Mankato at the corner of Highway 13 and Carlson Drive. 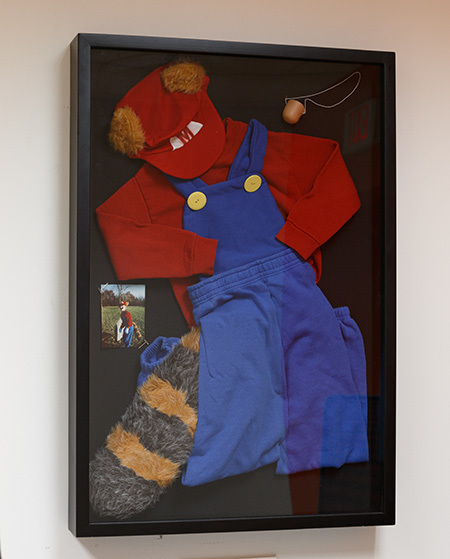 Tom Fallenstein’s 1988 Halloween costume made by his mother Janice hangs on the wall near his office. Fun.com is the parent company that owns the domains halloweencostumes.com, and shirts.com. According to Fallenstein, 80-90 percent of sales still come from Halloween costumes. But with millions of dollars in infrastructure and automation invested in the North Mankato facility, Fallenstein is focused on expanding his business growth beyond that season. Right now, Fun.com is license heavy, based on pop culture products, mostly costumes. The biggest sellers are Star Wars and superheroes. “If you love Star Wars, we’ll have every type of product you can think of on Fun.com,” he says. Shirts.com was Fallenstein’s first attempt to expand the season a bit, but it tends to also have spikes. For instance, at back to school and Christmas time. While Fallenstein tries to manage those ups and downs, he also manages another key part of his business success. The culture! It’s a value system Fallenstein has developed over the years of pursuing his own passions. In this interview, he talks about his personal mission to help others find the success he has and the challenges he faces even with a powerful tool in the Internet. Entrepreneur is a word being thrown around a lot in business these days, but I would argue back in the early 2000s you were one of the pioneers of entrepreneurship in this region. I had that drive, some of it came from my parents. They were both entrepreneurs. And although I may not have realized it at the time, I was definitely surrounded by that way of thinking. So without even knowing, I was learning. My mom was always figuring out the most efficient way to do a task. One that comes to mind is she would have to do all the billing for her garbage and recycling company. And instead of doing it one at a time, she would lay out all the different envelopes, put them in order, fan them out, wet them all at once and just go. I was just surrounded by that and now I take that mentality to everything I look at. I always look at a task and think ‘what is the most efficient way to do this’. I was born into it. I think with entrepreneurship part of it may be born, but I think a lot of it is taught too. Plus, I was just always thinking of new things to try. As I was growing up I started selling baseball cards when I was 7, I sold glow sticks at Fourth of July. Those were my first entrepreneur adventures. I started a lot of businesses early. I started a band in college, I fixed people’s computers. I’ve always tried new things. One of them finally exploded! And at that time, late 90s/early 2000s, people were just starting to realize the potential of the Internet. You just seemed to embrace it. It was becoming something already so it was more I was just at the learning stage in my life. I graduated with a computer science degree from MSU Mankato, but also a graphic design minor, mostly because I find more reward in creating products. That visual component is important to me. So, at that time, I wanted to learn how to build a website. I saw it as a way to merge my two passions of computers and creativity. It just so happened that my family had this local costume company, so it was a learning thing for me to go and say let’s see if I can build a website for Costumes Galore. Then I started a band so I’m like oh, I’ll build a web site for the band. So it all really just kind of expanded from me wanting to learn things. I didn’t even have to invest much money. It was $20 for a domain name and $20 for hosting, so the biggest investment was my time. Tom with the company’s Purple Monster mascot. It is hard to believe that was just 13 years ago. Look where you’ve taken it! You always seem to be one step ahead. We are trying to stay ahead by developing Fun.com and our expansion there. By now we know how to pick and pack items like apparel and clothing really well so the next step as a company is to expand into the other seasons. We already have the infrastructure in place, so it won’t cost us any more in that regard. What helps us stay ahead is we have a very good team that is nerdy and loves their comic books and pop culture stuff. So we are on top of every new thing that’s going to be coming out before everyone else is. We mirror our customer base so we are creating products around that. With your sales figures, is there more room in the market? Yes, there’s a lot of opportunity internationally for us still, both in Halloween and with Fun.com. And we are actually testing out 3 pop up retail stores this year. Knowing we want to continue to expand on Halloween and beyond, the question is how do we get our brand in front of more people who maybe aren’t shopping online yet or want to see something first. We have great return and exchange policies, but sometimes people need to see it before purchasing. Anything we can do to get in front of more people we are willing to try. You just mentioned wanting to expand internationally. Will you stay in North Mankato as you grow? Yes, but we’re getting to the limits of our building here so next year we have to do something. It might be additional off-site space. We’re looking at another location in the United States asking ourselves if that makes sense from a shipping perspective. Or does locating internationally make sense? That’s where we are trying to expand so maybe we move some distribution or shipping of products over there for a third party to handle. We don’t know yet, that would likely mean reducing what we need here in certain areas. That said, it would also allow us to grow here in other ways. It’s crazy to think about, I learned a lot from my parents, but not how to expand internationally or have multiple locations and how to handle that. So I am to the point of needing more mentors myself and people to lean on for support. I have a couple of people. I have a personal mentor who has bought and sold three different businesses and I have a good friend in private equity. I’m actually starting to look at developing a board and getting more advice that way. Now I find I like developing people as well. What would you say to young entrepreneurs, or what do you wish you would have known? The first thing I always tell people is I think most people overvalue ideas and undervalue execution. So people hold their ideas close to them and say ‘this is worth a million dollars’ but it’s really only worth a million dollars if you can go do it and take that first step. It takes action. People are even afraid to share their ideas for fear people may steal them. From my perspective, I’ve got a thousand ideas myself. So while others may focus on their idea to make a million dollars, well, I’ve got to focus on things that make 10 million dollars. Don’t be afraid to share, I’m glad to help you and show you how to make a million dollars. I would love to make more millionaires in Mankato! I think I’m guilty of that. I have a million ideas a day, but none of them get out of my head. People need to share and talk through their idea and get people behind it. Use mentors and get different expertise to get a business started. And then it’s all about actual execution. I’m really good at day after day relentless work. I can see the value in doing each step in the process. I even used that mentality when I started a band. A lot of people have the idea of ‘I want to be in a band’, but they don’t take any action to get it started and it ends there. For me, with my ideas, I think ‘what would the first step be?’ With the band I thought, well, I’ve got to create a poster, then I’ve got to put up posters, then I have to think about where should I put up posters. Just break it down to all those little steps that need to happen. So just think about, ‘this is what I need to do today’ rather than just thinking, ‘this is a cool idea’. I think you proved that you don’t need a large monetary investment to get started. For that first website I built I had $5,000 I borrowed from my parents. I didn’t need huge investors. I spent $5,000 on my initial costumes and figured worst case, I’m buying this at wholesale, I can at least sell it at the price I’m buying it for so I’ll break even. It wasn’t risky at all. People think you need to be really risky, but you don’t. You don’t need financial backers. Just think, what would be a small step you could do without needing a ton of money? And get started. Do you see your role now as more of a teacher? Yes, and I see myself trying to reach out more and find more opportunities where I can do that. I just spoke at MSU and am now looking for other engagements like that where there are young entrepreneurs out there looking to start a business that I can help with or invest in. I am really eager to teach more people and help Mankato grow. A personal life core value for me is helping people in a way they couldn’t help themselves. Teaching is kind of a major piece of that. Is this a good environment for entrepreneurs? I think it may be a little limited in resources which is why I want to help more, because I think I can be a great resource for those starting out. In fact, that can be the first action step that I mentioned. Asking for help shows me they take action and are willing to do it. I’m actually working on a book right now to talk through some of that stuff. It’s important for me personally to talk through it, and a lot of my employees want to know about that stuff too. I am just getting started, it may take a year yet to finish it. It’s made me think about where did I learn these skill sets and what skill sets do I really want to teach people? You are running an $80 million company, looking at expanding…and now writing a book. Aren’t you exhausted? (He chuckles) Well, I have a really good team. So to be honest, that takes some of the work off me. Over the years I have learned to let go of certain aspects. I used to have to do everything myself, especially when we first started. But now I have a great team so it’s actually probably less work than when I started. Saying that, it’s a lot more stressful. If anything goes wrong, it now impacts 160 people and not just myself. So the stress level is definitely higher but my workload is probably lighter. Was it hard to let go though? Yep! But you kind of find over time that it is necessary. I always felt like if I was doing it, it could be done a little bit better. But I have come to realize if I can get 10 people doing a task at 90 percent of what I was doing, well that’s okay. By including others I can get ten times the work done. So I’ve kind of just learned that 90 percent of what I would do is better than it not getting done at all. Over time I’ve learned that these people I passed things off to actually end up doing it better than I ever would. And you have some pretty high tech automation here, I’m sure that has helped? It has built on itself step by step. With the motors and automation, we brought in consultants to show us how it all fits together. They showed us options at different price points so we could run through it: here’s how many orders we’d get out of this type of system, and here’s how much time we can save with this one. We just look at time saved versus how much it cost. So if the machine costs a million dollars, but we can save $250,000 in labor, then okay it’s paying for itself in four years. Three years if we are growing. You have 160 employees year round, but at the peak season, which is what now? July through October? You hire over 1,700. Would you say that is the biggest challenge finding bodies to get the work done? It’s always a challenge, but we’ve started to get a good reputation for just being a really great place to work. One part of that is we can offer great training for new people. For example, we get a bunch of college students to help us with recruiting. Where else are they going to get an internship where they try to hire 2,000 people? It’s just great job experience. 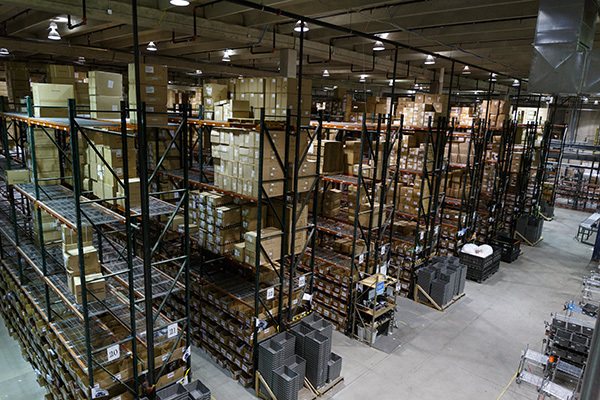 Even in the shipping and warehouse departments there are great opportunities. We’re doing 40,000 orders in a day and a brand new high school student may come in and within 3 weeks we are saying, ‘you are going to be lead and start teaching others’. We also see retired people join us for extra Christmas money, or to just join the atmosphere. We really have a great array of employees who join our team. 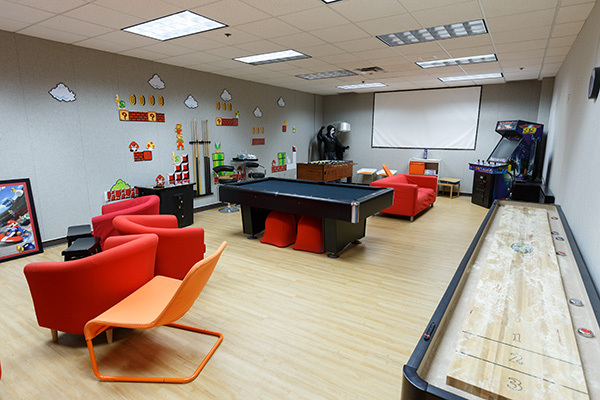 Plus we offer a different working environment. For example, a lot of us run around on scooters. So, we add fun into the work environment. Because of all of that we are getting a lot more repeat people back year after year. Word of mouth has gotten better too. I would say 1,700 is peaking on what we can get out of Mankato, I mean, 40,000 people live here and we are getting 3% of them. Our vice president of human resources is relaxed for like one day: Oct. 31. Then he has to start worrying about the next year! An important role Fallenstein plays in the community is as a board member for the Miracle League of North Mankato. The Miracle League manages Fallenstein Field, which is a barrier free handicapped and wheelchair accessible softball/baseball field located next to Caswell Park. The field allows children and adults with all types of disabilities to participate in softball/baseball activities, including competitive wheelchair softball. The field was built according to National Wheelchair Softball Association Specifications. Know the Value of Your Time. Fun.com does manufacture some of its own products in China, but mostly it buys licenses to sell others’ wares. Fun.com carries licenses for Disney, Paramount Pictures, Universal Studios, Sony and more recently Marvel. Fallenstein says they expect to be constantly launching cool new products that no one else can offer. Some of the more popular products center on the Star Wars franchised merchandise. Fallenstein spends as much of his free time as possible with his wife and one-year-old son James. He lists skiing and golf among his activities. But his favorites revolve around his passion, that also happens to be work-related. In college, Fallenstein formed an alternative rock band with three friends, called Faully. The guitar proved to be another outlet for Fallenstein’s creative tendencies. The group started out playing mostly for family and friends in their community. But soon they became a force in the Midwest underground music scene. Traveling to Indiana, Illinois, Iowa, Missouri, Nebraska, Oklahoma, Texas and Wisconsin to play for a faithful following. “It was great! We did a three song EP at first and eventually a full length album,” he reflects. “We traveled and did two week tours from Minnesota to Texas and back. It was actually a big decision at one time. I had to decide do I stick with the band full time and try to make it work, or my business is starting to take off so which do I pursue? This one seemed more logical! Now Fallenstein says the only time he picks up a guitar really is to play for his son, who may be following in his father’s footsteps.